I never knew that there were so many types of chocolate and I don’t mean the white or dark chocolate difference but at an even more fundamental level – the cacao beans used in chocolate, has 3 different varieties: Criollo, Forastero and Trinitario. 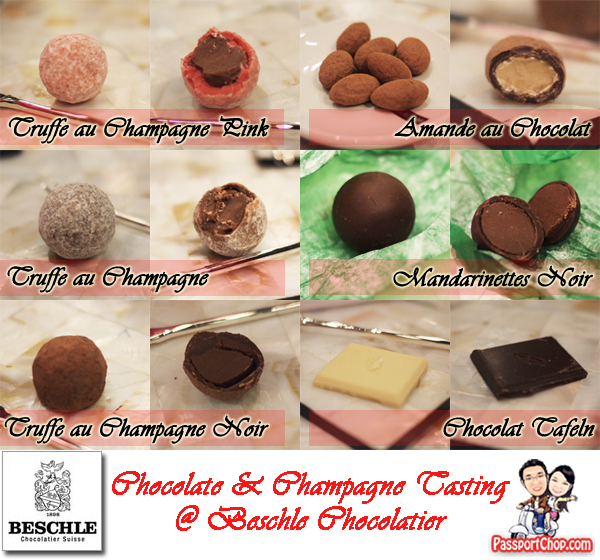 These are just some of the nuggets of info I picked up while doing a chocolate and champagne tasting at the Beschle Chocolatier Suisse luxury boutique chocolate shop at Mandarin Gallery along Orchard Road. 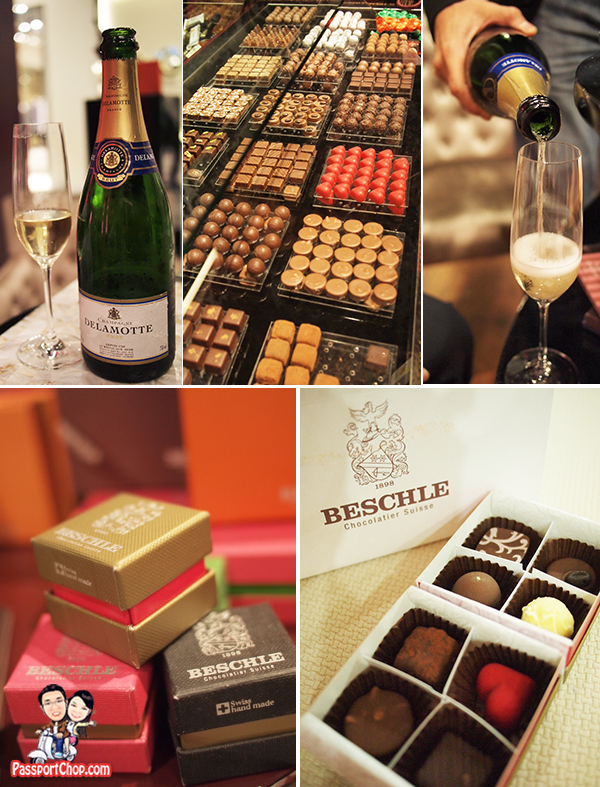 This $128 chocolate and champagne tasting session for 2 was made possible by TheSweetSpot.com.sg. which offers great deals for luxury lifestyle experiences around the world. During this one-hour chocolate and champagne session, we tried samples of different types of pralines (which is a hard chocolate shell with a softer filling). The Truffe au Champagne which is the most common praline available at Beschle Chocolatier comes in different flavors – each of which contains the Finest Marc de Champagne (Champagne brandy) coated with either milk chocolate or dark chocolate (for the Noir version) and icing sugar. The Pink version is made especially for the festive season and note the thicker coating for the Truffe au Champagne Pink chocolate in the picture below, which is due to its pink coloring. Typically good pralines have very thin coating, as evident in the Mandarinettes Noir (which is the pride and joy of Beschle Chocolatier – this is an invention of the company and only available at Beschle stores). The reason why the chocolate pralines at Beschle Chocolatier taste so good is because they are made only from the finest of the cacao beans – the Porcelana, the genetically purest form of Criollo cocoa bean which is the rarest (only about 5000 tonnes are produced each year!) and most expensive cocoa on the market and is native to Central America, specifically Venezuela. These beans are so rare that only selected chocolate boutiques – Beschle Chocolatier being one of them, are allowed to sell chocolate made from Porcelana Criollo beans. The Delamotte Champagne plays just as an important role in this chocolate tasting session. It clears your palate so that you can taste the pralines in its truest forms and unlike other champagnes, there isn’t a fruity aftertaste which might ‘contaminate’ your tasting experience. One reason why pralines made from Porcelana Criollo beans are so sought after is its longer duration aftertaste, very different from other common types of mass market chocolate (typically made from Forastero cacao beans) which gives you just a quick sugar rush. Another unique feature of Beschle Chocolatier which distinguishes itself from the competition is its exquisite packaging which is customized according to season e.g. Christmas and even Chinese New Year (you can find Year of the Rabbit packaging for boxes of champagne truffles in the Singapore Beschle Chocolatier outlet!). The chocolate boutique even allows for personalisation of your preferred packaging in 4 different ways starting from the color of your box, sleeve design, box size and of course the content (you can pack different flavored truffles in one box). After sampling some of the best chocolates and bubbly in the world, we also got to take home a delectable box of Swiss handmade pralines (like what you see in the picture below) and we were spoilt for choice with a huge array of different exquisitely handmade pralines which are air-flown all the way from Switzerland weekly. The keyword here is handmade – each of these pralines are painstakingly handmade by chocolate craftsmen back in Basel, Switzerland where Beschle Chocolatier’s home office is based. This is also reflected in the prices. Each praline cost S$3.80 and for a box of 4 pralines, it will cost S$18 (the box costs extra). There are even Beschle chocolate spread and coffee – check out PassportChop.com Facebook pictures for more of what Beschle has to offer besides pralines. 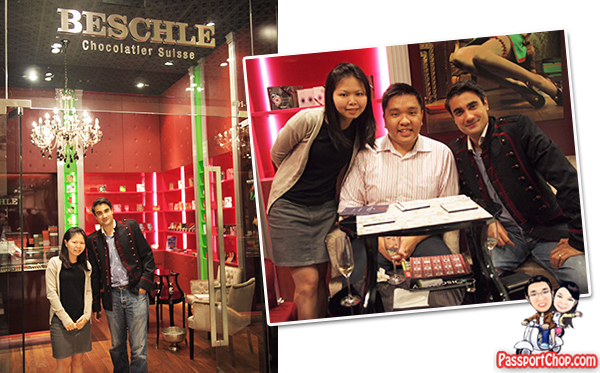 Our chocolate and champagne tasting session at Beschle Chocolatier Suisse was conducted by Mr Shumit A. Chanda who is the Director of the Beschle store in Singapore. He shared with us lots of info about the company and its famous champagne truffles – very fascinating info which perfectly complements the delicious pralines and champagne served at the store’s own chocolate tasting table (Yes! They even have a chocolate tasting table!). Each piece of info in this blog post came straight from Shumit who talked in detail on the effort behind making each praline e.g. over 72 hours of chocolate mixing with champagne just for the inner filling of the Truffe au Champagne pralines. TheSweetSpot.com.sg provides members exclusive access to the most sought-after luxury lifestyle experiences and indulgences in Asia. Whether you’re looking for a mouth-watering new restaurant in Singapore, a hidden gem for a weekend getaway in Southeast Asia, or the ultimate spa experience in Hong Kong, The Sweet Spot serves up the finer things in life at fantastic prices. For weekend getaways, The Sweet Spot offers great deals too e.g. $1925 for a 3D2N getaway at one of the finest villa – the Racha Spa and Villas at Phuket which promises an indulgent (spa and island snorkelling) and exclusive (limousine airport and speedboat transfers) experience for 2.